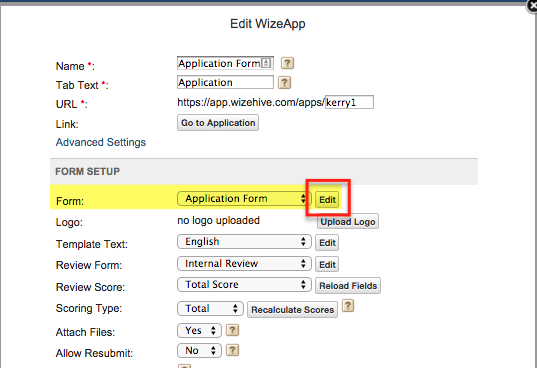 Whether you built your form initially or someone from WizeHive or another member of your team did the initial build, it's worth noting that you can go in to the form builder at any time to make required edits and changes to the form. Here is how to go into the form to make changes yourself. We also call this the data tab. If it's an application form, the tab may be called Application. It will be a custom-created tab that houses your form. Once here, click the Form Settings button in the top right corner. 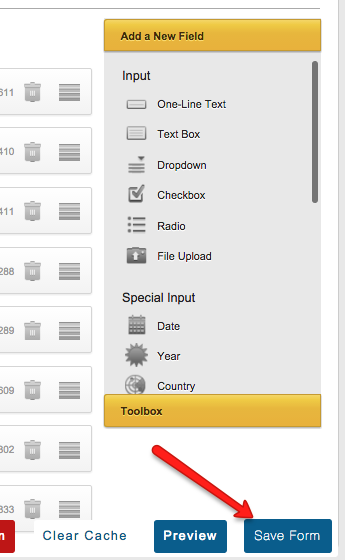 Within the form settings, you should see a section entitled Form Setup; the first dropdown there will be called Form. The dropdown should be set to the application form if you have accessed the application tab. If you already see the form in question that you wish to edit, click Edit. If a different form is selected in this dropdown, change the form in the dropdown first, and then click Edit. Pressing Edit will open up the WizeHive form builder, which will look something like this. Edit a Field: Click any part of the field in question in order to open up its settings and labels, and make changes. Delete a Field: Click the trashcan icon next to the field in question in order to delete it. Move a Field: You can drag and drop a field to move it by hovering over the horizontal lines icon on the right of that field, clicking and holding it, and dragging and dropping it to the new location. 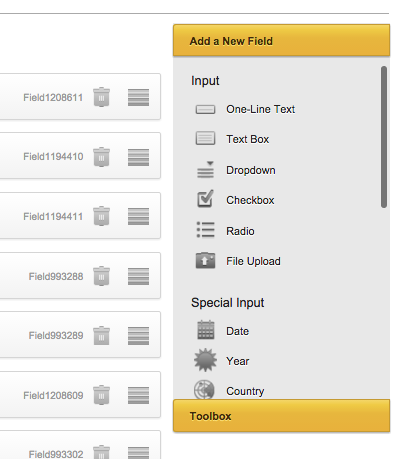 Add a Field: You can add a new field by opening up the yellow toolbox, selecting the field type you'd like, and dragging and dropping it on to the form. When you are done making changes, be sure to press Save at the bottom of the form builder. You will know the form has been saved when you see this message at the top of the screen. At this point, close out the form builder tab of your browser to return to your Form Settings and your workspace.